A friend of my wife’s gave me this book to read with assurances that I would certainly enjoy it. 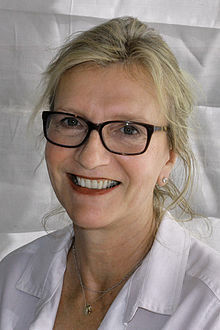 One night, when I was about half way through the book, there was an interview of the author, Elizabeth Strout, by George Alagiah on the BBC World News channel. The interview was recorded at the last Hay Festival. I warmed to Ms Strout – in part – because two nights previously there was another interview from Hay of a poet, whose name I don’t recall, and whom I found unintelligible. In her interview at the Hay festival, Ms Strout said that her writing is shaped by the ordinary people she knew in Maine. My Name is Lucy Barton is centered on the unexpected interaction between Lucy Barton, who is in hospital suffering from complications following surgery, and her estranged mother, who has flown east to be with her. Throughout the book, Lucy has recollections about her childhood in rural Illinois with an impoverished family: distant father and mother, a sister and brother. Lucy, herself, has gained an education, a marriage, two small daughters, and a career as a writer in New York City, thus estranging herself from her family. The dialogue between the two women is both limited in the sense that there are unspoken words, and informative in revealing something of their respective characters. Ms Strout strikes this balance in her writing very well. She also uses the descriptive recollections of people of the past to elucidate some of the values of the principal characters. She uses unique voices which shed light on the characters, and her writing style flows simply. Characterisation is clearly Ms Strout’s strength. My Name is Lucy Barton is, at 188 pages, short enough to be considered a novella, rather than a novel. For me, while the writing flows beautifully and the characters are very much alive and their circumstances unique, what was missing was how and why the current circumstances arose. Why, for example, did Lucy’s father lock her in his pickup for hours – on one occasion with a large brown snake? We are told that is was a frequent occurrence, but we don’t know why, and knowing why and how it came about would shed further light on the characters. All of the characters are certainly interesting, but I feel like a hungry diner who was served only an appetizer.